Soho Bar - Belgrade again has to offer a cult place. Soho Bar Restaurant is located in No 52 Strahinjića Bana Street, in the central part of the Silicon valley. Soho Bar has opened its doors to the urban Belgrade elite, to the people who can recognize a good place and quality fun at first sight. An owner of this Bar is already well known as an owner of La Piazza and Fracci. 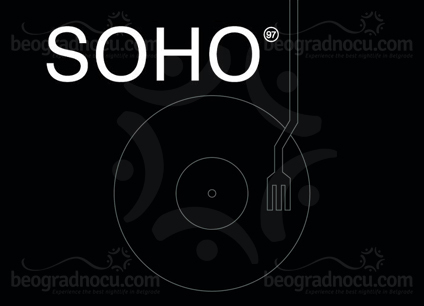 We warmly recommend you to inevitably visit Soho Bar, which beside a large selection of drinks, cocktails and coffees offers you a quality musical program. Soho Bar is well known for its great atmosphere, quality food and great music program, which includes the sounds of electro and deep house music. Popular Djs play lounge, house, jazz, acid jazz and many other quality beat rhythms which always offers you an inexhaustible source of positive energy and a great atmosphere at this great bar. In order to convey authentic spirit of the famous London neighborhood by which this Bar was named after, the designer of Soho Bar designed an interior modeled on the most popular London bars. The bar’s interior has a modern design, with simple lines and in black color. Soho Bar is also a Sushi Fusion restaurant, belonging to the group of Asian cuisines which enchants with its light and exotic tastes. There is no need to speak much about the Soho Bar’s cocktails, since it is already well known that they are the best. Simply said - please come and enjoy. During a daytime, Soho Bar offers you fantastic food and various culinary specialties for a full enjoyment of all your senses, which you simply must try. Bar Soho Bar offers a various food. The main offer on this cult place’s gastro offer currently is Asian cuisine with specially recommended sushi. Besides sushi, here you can try Japanese tapas, tempura, soups, yakitori, teriyaki, salads and different kinds of appetizers. Even though we added some new thing on our menu, Soho Bar jealously guards the Belgrade spirit in it, for which many have said that it reminds them on the New York spirit. Soho Bar is an excellent choice for having lunch with a family or spending time with friends. In the very basics of Soho Bar’s business philosophy lie quality, the highest level of service and creativity. As the day goes by, we recommend you to try some of our many exotic cocktails. The guests of Soho Bar are mostly older clientele, urban and city elite. In Soho Bar you can usually see politicians, athletes, so as famous and popular people. Belgrade’s Soho synthesize daytime and nighttime going out, and the reservation is required. Soho Bar-restaurant is a trendy place with the New York spirit, and you are all invited and welcome.